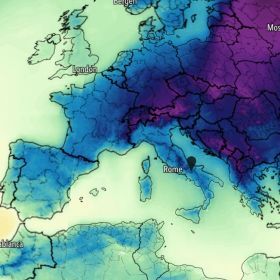 Italy is in the grip of a severely cold bout of snowy, icy conditions that threatens to have a major impact on supplies of key winter products including salads and citrus, as well as affecting later supply of products such as table grapes. Thomas Drahorad of trader NCX Drahorad said conditions continued to be challenging for producers and distributors across much of the south of Italy, with snow and ice raising fears of potential damage to a range of crops. “Since the 5th of January, there has been unusual snow, cold and strong winds throughout southern Italy. The region of Apulia has been the most affected, but Sicily, Catania and Palermo have also been affected,” he reported. While all major national roads and motorways remain accessible, many of the less important routes – especially those country roads connecting to production sites – are apparently blocked. “This is a cause of particular concern for dairy farming, because it hampers daily collection, but for it doesn’t look much better for deliveries of fresh vegetables. In grave danger, Drahorad suggested, are the plastic tunnels used by growers to protect their crops. Not only do the conditions raise the cost of artificial heating sharply, there is also a fear of collapses. The cold wave gripping much of Italy is forecast to last until 12 January, which could put extreme pressure on the supply of markets to the north, at home and abroad – compounding last week’s rain damage in Spain. “Power cuts are being reported again and again. There will be a lack of volumes and quality, and prices will rise,” Drahorad predicted. Puglia is one of Europe’s main supplier in winter for many types and varieties of salads and other vegetables, some of which have already been damaged by the cold temperatures.